There is no doubt this is a great achievement which brings users’ functionality of the ModulTrade platform to the next level. 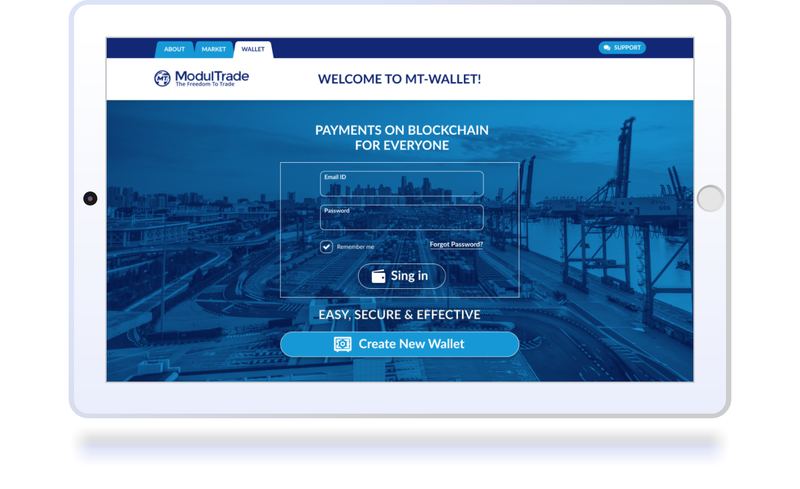 The wallet makes buying and selling goods on the platform much easier: it takes care of all payments on the platform, makes the payment process simple for every user, without charging transaction fees on the ModulTrade side. In addition, some cool features like token exchange and buying for fiat will be added soon. Why did we decide to make another crypto wallet? On the way of building ModulTrade blockchain based marketplace for small businesses, the ModulTrade team understood that we have to provide an easy and secure gateway for SMEs to allow them to enter into the crypto environment. Transactions in MTRc are free in ModulTrade wallet. 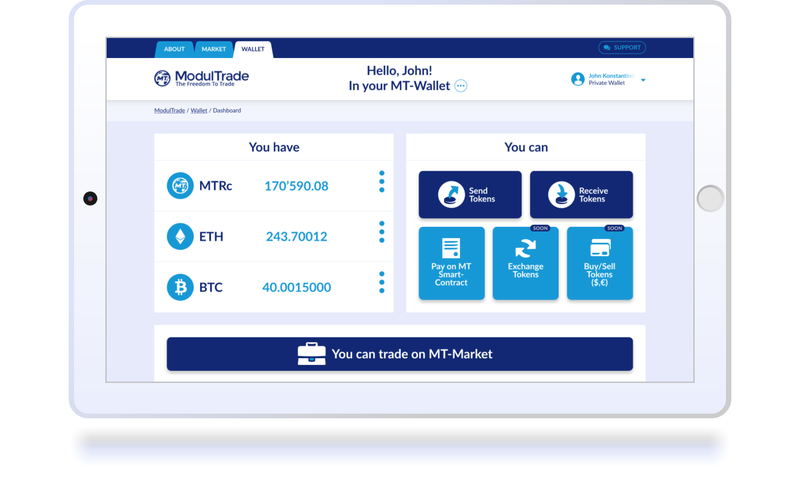 To give our users an incentive to start using the wallet, we decided to remove all commissions related to MTRc transactions when using the ModulTrade wallet. Global Trade Finance was never so easy and cost-effective. We have been working hard together with our UX designers to make it as intuitive as possible. It is a new leap in way of operating with crypto — the MT Wallet will help professional crypto enthusiasts and every crypto newcomer in his day-to-day operations with BTC, ETH and of course MTRc. Following our baseline and regarding best practices — we spent a lot of time and resources to make MT Wallet safe and secure. As a target, we plan to be compliant with PSI DSS standards and pass the subsequent audit in the near future. The MT Wallet is based on “three whales”: cost-effective, easy to use and safe. After operating for one year in the crypto space, we have to admit it was a great journey. We have seen bull and bear markets, ups and downs, but managed to survive. It was a pleasure working with such a supportive community! 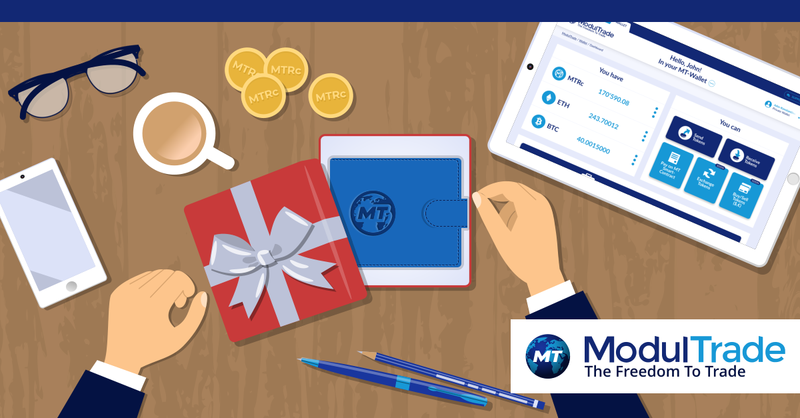 Birthday is always good time to announce something special — you can now trade MTRc on Livecoin.net! ModulTrade CEO, Evgeny Kaplin, with 17-years experience in Trade Finance Business, started the revolution in Global Trade with the help of Blockchain technology aiming to provide secure and efficient trade services without intermediaries. 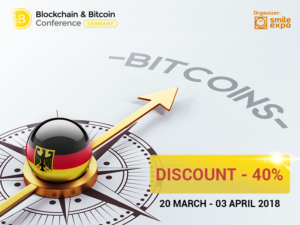 We all hope for the best in the future, join our vision and celebrate with us! A big thank you from the ModulTrade team. Next Post: Russian global IT-platform BUZAR from Olga Buzova!